The early admission process is designed for students who are born between September 2 – October 13 and are seeking enrollment to school one year early. Children must be 4, 5, or 6 years old by September 1 in order to enter Pre-K, kindergarten, or first grade, respectively. According to HCPSS Policy 9000, early admission requests to Pre-K, kindergarten, and first grade will only be accepted for children born on or between September 2 and October 13. There are no exceptions to this date-of-birth window. Applicants for early admission to Pre-K, kindergarten, and first grade must be current Howard County residents during the course of their application in order to be assessed for early admission into a Howard County school. Although early admission is rare, exceptions are made only after a variety of items have been reviewed by certified early childhood educators. In all cases, early admission does not guarantee that the child will be promoted to the next grade. 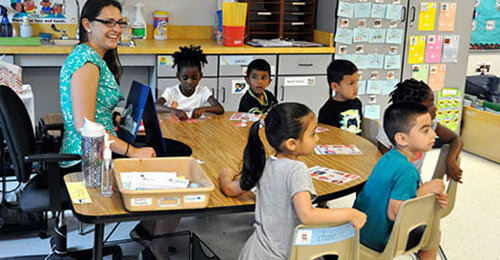 Early admission to Pre-K is based on intensive student needs and economic disadvantage, whereas Kindergarten and First Grade are based on rigorous academic standards and testing. The student must complete and score favorably on an admission test conducted by HCPSS. Applications require completion of developmental checklists. A teacher will closely monitor the child’s progress for the first month (30 calendar days) at the school they are admitted to. The teacher’s observations during the trial period serve as the final assessment of the child’s readiness for the program. For early admission in the 2019-2020 school year, the testing period for applicants will begin March 11, 2019 and conclude May 10, 2019. Early admission applicants must pass an assessment at their school by designated school staff in a one-on-one setting.